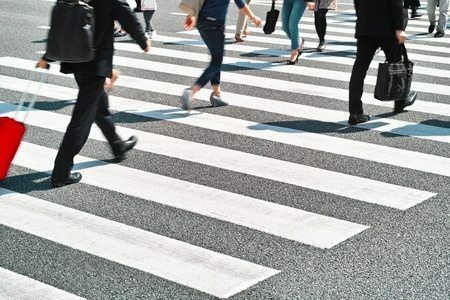 Pedestrian accidents are becoming increasingly common and it’s crucial that if you plan to be walking — either to and from somewhere as a mode of transportation, or simply for exercise — that you use caution and be aware of what you can do to decrease the risk of being hit by a motor vehicle. Here are some ways to stay safe as a pedestrian and what you should do if you or a loved one were hurt by a negligent driver while walking. Whenever possible, use a crosswalk to cross an intersection. If no crosswalk is available, pay attention to the lights and the traffic to judge the best time to walk. Try to stay in well-lit areas when walking, especially if you’re walking at night. For example, take a main road with plenty of street lights instead of a back road with no street lights if you’re walking at night. Do this even if the main road is a slightly longer route. In today’s technologically advanced society, everyone has a cell phone in their hand or their pocket. If you’re walking, it’s best to keep yours in your pocket until you reach a place free of traffic. At this point, you can safely use your phone. Don’t listen to music that keeps you from hearing cars approaching. Also, try to stay distraction-free so you are aware of your surroundings while walking. Light or bright clothing is a must when walking day or night, but it becomes even more important at night. Avoid walking at night if you can, but if you have to, wear light or even reflective clothing. You want to do everything you can to ensure that a vehicle will be able to see you while walking in enough time to avoid you or go around you. If you or a family member were hit by a vehicle as a pedestrian, you are likely suffering critical and perhaps even life threatening injuries. Frequently, families lose a loved one in a pedestrian accident due to the negligent driver of a motor vehicle. Don’t hesitate to reach out to our office to schedule a consultation to discuss obtaining justice and compensation after a pedestrian accident. Call today at (706) 515-1995.